Eyewitness sketch from 2005 Kentucky encounter. Much better late than never, is my motto when it comes to witness sketches. 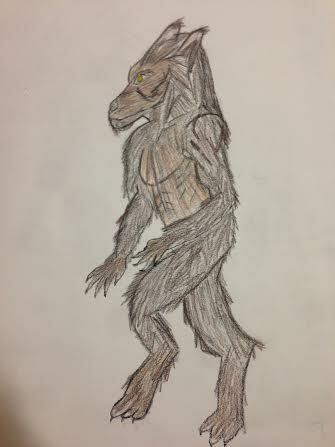 In “The Michigan Dogman, Werewolves and Other Unknown Canines Across the USA,” I passed along a sighting told to a Kentucky man by his wife who saw a seven-foot dogman in 2005, and who, himself, then began experiencing many of the signs that often accompany such sighting areas: large, weird footprints, the sense of being watched, unidentified growling, pets disappearing and fearful dogs. The couple lives in the forest-and- wildlife-rich Bullitt County. The book was published in 2010, but I heard from the wife (who wishes to remain anonymous) this past week. She explained that she still thinks about the creature she saw standing in her driveway, and finally felt driven to make a sketch of it. It looks very much like most eyewitness descriptions of dogmen, except for the fact that although it clearly walked upright on doglike legs, she said its paws appeared more “human-like.” I hear that once in a while, and believe it could be explained by the fact that most dogmen, according to eyewitnesses and footprints, seem to have somewhat elongated paws and very long claws,a combination that could appear hand-like, especially from a distance. She also said its head resembled a German shepherd’s, its eyes reflected yellow, pointed ears on top of the head, covered with dark fur — very like most dogman or manwolf reports. Interestingly, the ears included those strange tufts that witnesses sometimes report. She was certain that it wasn’t a bear. Although the optimal time to create an eyewitness sketch would certainly be as soon after the sighting as possible, I hear time and again that the sight of the creature is etched permanently in the memory of witnesses. Still, I always take the passage of time into account when judging any sketch’s accuracy, along with the artist’s drawing ability and how well it matches the written description. This one is quite nicely drawn, and I do wish I would have had it for inclusion in the book. As I said earlier, however, I’m glad just to have it at all and add it to the growing number of witness sketches from over the years. By the way, Kentucky is a state with many sightings of upright canids. My friend, Bart Nunnelly, has also collected many of them in his book, Mysterious Kentucky.